The history of software development is more like a battlefield of failed or overspent projects. In a 2013 survey of projects managed by traditional methods 55% of projects were either failing or seriously in trouble (ref). Agile frameworks have been established to try and correct these problems. The agile manifesto was produced in 2001 and was a call to arms for people to find a more constructive development approach. The Scrum process is about running projects as a series of Sprints. This means not planning the whole thing at once, but planning to produce the product in phases with ever richer functionality. You can see the sprints as a series of “plan – do – deploy – adapt” activities. By producing releasable product early we learn as we develop always improving the process. This is called a control feed back loop and can be very powerful in developing an empirical approach in your company. The feedback we garner at the end of the sprint process is from the customers, stakeholders, product team and organisation all of which help us improve our product and process. The whole of the agile movement is based on empowering teams to take ownership and responsibility for projects. The organisation moves away from a project manage led process to coaching product teams to be self organising and internally motivated. Scrum places checks and balances in the system to ensure that the team can grow into a powerful self organising group. If it is not FAST it is not Scrum. Scrum relies on sprints which produce releasable increments of a product every 2 – 4 weeks. Inspection develops on from transparency. In Scrum we prioritise inspecting our code and systems hand in hand with the development of the product. We value early feedback from the client, stakeholders and product owners to ensure the right thing is being built. We prioritise our work load by analysing the wish list from what will add value to the customer. The traditional role of product manager is replaced with product owner who is an integral part of the Scrum team. We will learn more about this in key processes. Scrum is an empirical framework which is seeking to gain feedback from customers, stakeholders and the development team early and regularly in the process. This feedback is then used to change priorities and behaviours to enable the team be more effective. We will learn more about this in key processes. The success of Scrum in an organisation is dependent on the company being prepared to embrace change. 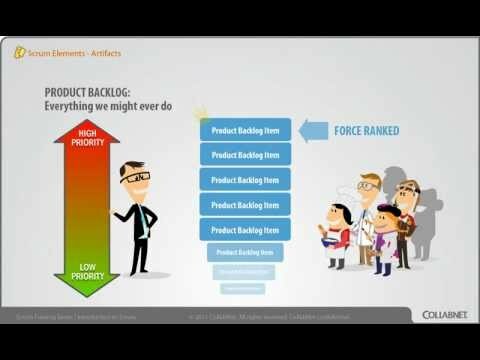 The following video explains some of the organisational issues when using Scrum. if you are planning to take the professional scum master 1 certificate you should aim at 90% on the test.